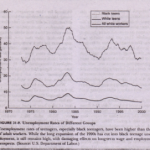 Let us first start by examining the causes of voluntary unemployment in a typical labor marker.A group of workers has a labor supply schedule shown as SS in Figure 31-6 on page 672. 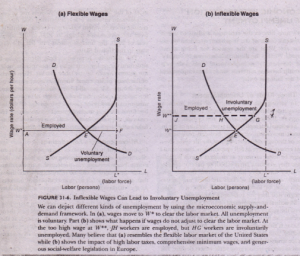 The supply curve becomes completely’ inelastic at labor quantity when wage levels are high. We will call L the labor force. 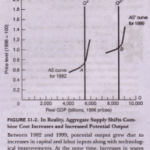 The left-hand panel of Figure 31-6 shows the usual picture of competitive supply and. demand, with a market equilibrium at point E and a wage of H”‘. At the competitive, market-dearing equilibrium, fifPmswillingly hire all qualified workers who desire to-work at the market wage. The number of employed is represented by the line from A to E. Some members of the labor force would like to work, but only at a higher wage rate. These unemployed workers, represented by the segment }:F, are voluntarily unemployed in the sense that they choose not to work at the market wage rate. But now go back to reread the quotations from unemployed workers on page 669.. Who would of voluntary unemployment. One of Keynes’s great breakthroughs was to let the facts oust this beautiful but irrelevant theory. He explained why we see occasional bouts of involuntary unemployment. periods in which qualified workers are unable to get jobs at the going wage rates. The key to his approach was to note that wages do not adjust to clear labor markets. Instead, wages tend to respond sluggishly to economic shocks .. If wages do not move to clear markets, a mismatch between job seekers and job vacancies can·arise. This mismatch may lead 0 the patterns of unemployment that we see today. 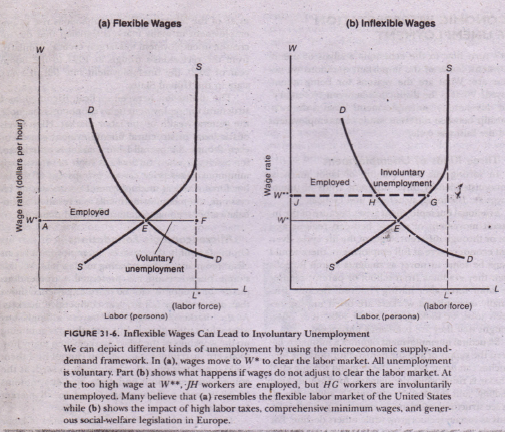 We can understand how inflexible wages lead to involuntary unemployment with an analysis of a non clearing labor market, shown in Figure 31-6(b). Here, an economic disturbance leaves the labor market with too high a wage rate. Labor’s wage is at. W** rather than at the equilibrium or market-clearing· wage of W*.. 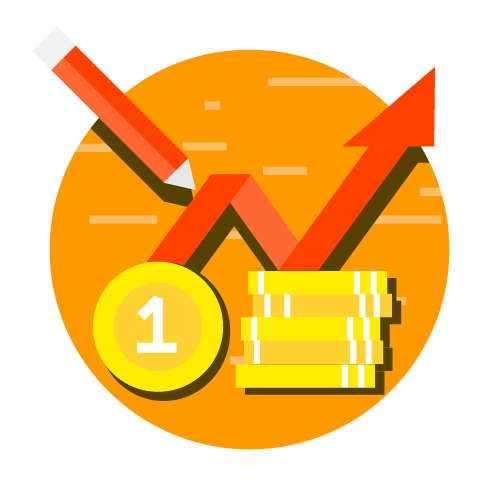 The opposite case occurs when the wage is below the market-clearing rate. Here, in a labor-shortage economy, employers cannot find enough workers to fill the existing vacancies, Firms put help-wanted signs in their windows, advertise in newspapers, and even recruit people from other towns.